Suddenly, after years of warnings by the Zetas, the establishment seems to be taking steps to limit death by airplane. After the explosion of the Russian Airbus A321 (7K9268) over the Sinai Peninsula, Russia, Britain, and other countries banned flights in that area. 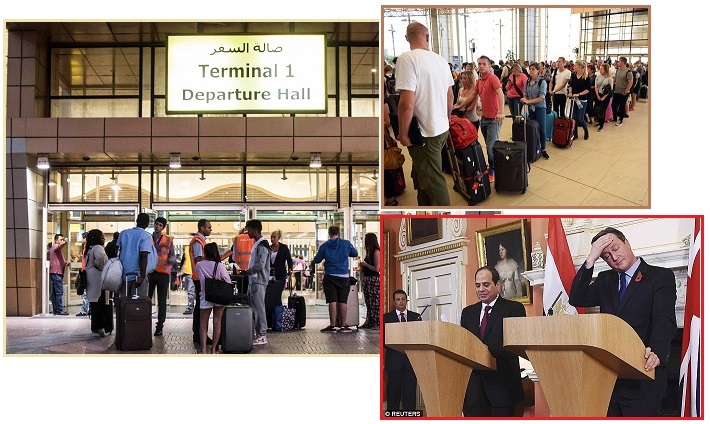 Tens of thousands of tourists were left stranded at Sharm el-Sheikh, eventually flying home without their luggage. The airline industries, meanwhile, were thumping the tourism drum, trying to drum up business. Airlines from several countries canceled flights to and from Sharm el-Sheikh, stranding thousands of tourists, after a Russian jetliner crashed shortly after taking off from the airport, killing all 224 people on board. British and U.S. officials have said in recent days that they believe a bomb may have brought the airliner down. Putin Suspends Russian Flights to Egypt on FSB Advice. Russian President Vladimir Putin has agreed to suspend all commercial flights to Egypt until an investigation determines the causes of the deadly Russian A321 plane crash. Airlines and tour operators are selling cheap last-minute flights and half-price holidays to Sharm el-Sheikh – even though an estimated 15,000 British holidaymakers are still stranded in the resort. 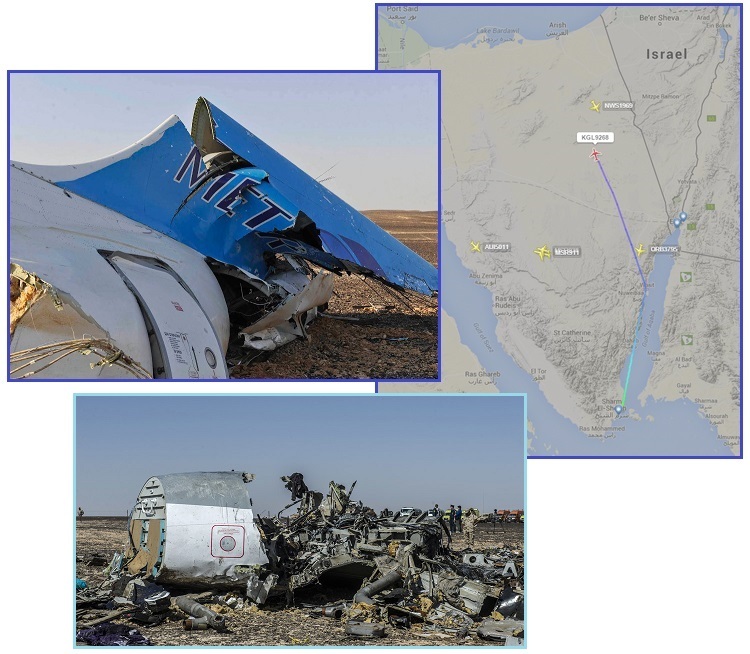 While ignoring evidence that the A321 had turned to cross the Sinai, heading for Cairo due to reported mechanical problems, and had been limping along, slowing down, the cause of the explosion in the air began to be reported as a terrorist bomb. No bomb residue could be found on the wreckage, but the conclusion was announced anyway. Russian media outlets said that the pilot reported technical problems and requested a landing at the nearest airport before the plane went missing. A source at Sharm El-Sheikh Airport told RIA Novosti the pilot of the missing plane requested a change of course, saying the jet would have to land in Cairo. When the news of the downed Russian plane initially surfaced it was made most clear that the pilot had spoken to Egyptian air traffic control, requesting to land at any airport because of a technical problem with the plane. I've never seen that mentioned in subsequent stories, yet it was heavily featured initially. Is that because it does not point towards the 'convenient current theory' that it was a bomb? Another source close to the investigation said the black boxes were yielding almost no useful information on establishing the cause of the disaster which claimed the lives of 224 people. The insider said the flight data recorder 'abruptly' stopped working just over 20 minutes from takeoff, without giving any clue over the nature of the catastrophe which hit the plane. And the voice recorder, including crucial conversations involving the pilots, is 'badly damaged' and 'may also be useless', according to Kommersant. Nevertheless, regardless of what excuses are given to the public for more safety in the air, there is a sense that the establishment has begun to take steps to stop flights over dangerous regions where EMP can and has created death by airplane, as the Zetas term it. For instance, the steps taken in Sweden when their radar began acting up. Unlike mid-2014 when planes disappeared from radar over the Danube River - repeatedly, and for days – Sweden promptly closed flights coming and going until the radar problems ceased. Good for Sweden! Of course the Sun was blamed, anything but the truth, and the solar storm only seemed to affect Sweden, but the point is, death by airplane was being thwarted, once again. 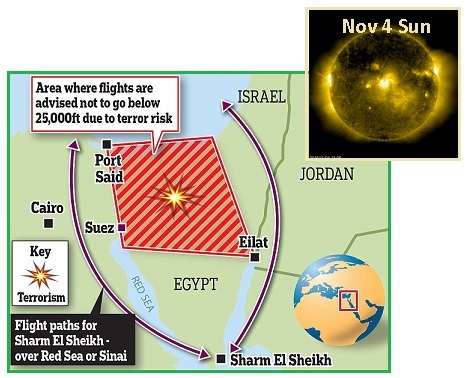 Meanwhile, flights over the dangerous water on either side of the Sinai Penninsula, which is tearing away on either side during the African Roll, are being forced overland. A step in the right direction, per the Zetas. Aviation officials say a solar storm knocked out the air traffic control systems in Sweden, prompting them to close the country's airspace for more than an hour. The civil aviation authority said the solar storm created disturbances in the Earth's magnetic field, which affected radar installations in southern Sweden. No such problems were reported in neighbouring countries. Agency spokesman Per Froberg said flights disappeared from radar screens in Swedish air traffic control towers during the blackout, which lasted about an hour until 5:30 p.m. local time (11:30 a.m. ET). Froberg said it was unclear why the impact was so severe, adding the last time something similar happened in Sweden was in 1999. An image from NASA and ESA's Solar and Heliospheric Observatory shows the sun as it appeared today. An unusually fast stream of solar wind with a series of shock waves has been hitting the Earth, creating auroras and polar geomagnetic storms. ZetaTalk Comment 11/14/2015: To their credit, Heads of State in various countries whose airlines could be affected by EMP from the charged tail of Nibiru are taking steps to limit death by airplane. The airline industry, and the travel industry, be damned. Profits are not as important as lives. Nancy has cataloged the list of dramatic EMP airplane crashes, and the ridiculous excuses given, in her latest Newsletter. Pilot error, pilot suicide, bad weather, all in the face of obvious electro-magnetic problems. The Sinai crash was not a bomb, as the plane was limping well before the explosion. EMP is both a brownout and a pulse situation, so the fuel pumping at first slowed and then ramped into hyper activity, similar to the step-up transformers on the Sayano-Shushenskaya dam in 2009. Sweden points to radar outages, Britain and Russia to insecurity about bombs on board, but by whatever excuse, airplanes should not be allowed to fly over water in the stretch zone, which Scandinavia through to Kazakhstan, and the English Channel, and the broad Mediterranean, and the Sinai region are. They will ask NASA to give careful reports on any evidence of pulse near Earth, then quickly blame it on the Sun. By whatever means, get those planes out of the skies! And following suit, taking care to ban flights over shallow water in either compression or stretch zones, per the Zeta advice, LAX banned flights coming or going out over the ocean. A capture on video shows the magnetic swirl switching directions within seconds, not what a missile would do, but the Navy was quick to back-fill the chosen excuse, even shooting off a real missile a day later as cover. The Zetas explain. Mysterious military activity west of Los Angeles International Airport is forcing the airport--one of the nation’s busiest-- to temporarily divert overnight landings and departures. 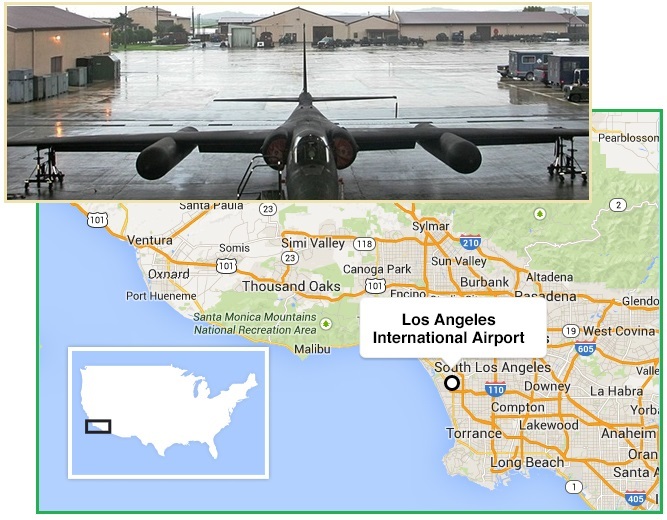 LAX began deviating flights after being told by the Federal Aviation Administration that military airspace west of the airport would be active for a week. The airport said the deviations would continue until Nov. 12. Normally, LAX routes flights from midnight to 6:30 a.m. over the Pacific to reduce noise levels for nearby residents in places like Inglewood who may be sleeping at that time. We were in Alhambra when we saw it. Weird object. Anyone know what that was over southern California? Only saw it light up for a minute here. Northeast Arizona with another streak shooting up behind it which made an hour glass figure. They're now saying the navy is testing along the coast but how are they seen so far away? I'm in northeast Arizona near the New Mexico border. I'm in northeast Arizona near the New Mexico border. My son saw it in San Diego! I'm in Ventura county. The military is not saying what exactly is causing the change, and LAX claims it's also in the dark. Six years ago, ABC7 cameras captured a military operation in downtown LA. Helicopters were seen swooping between high-rises, close enough that residents were able to see armed soldiers in camouflage outside their window. Authorities claimed it was part of a training exercise designed to ensure the military's ability to operate in urban environments and to prepare forces for upcoming overseas deployment. What's going on this week is a mystery. ZetaTalk Explanation 11/14/2015: Suddenly, and with very little advanced warning, LAX is closed at night for military exercises. This is not due to rocket launches, tests, which can of course be done elsewhere. 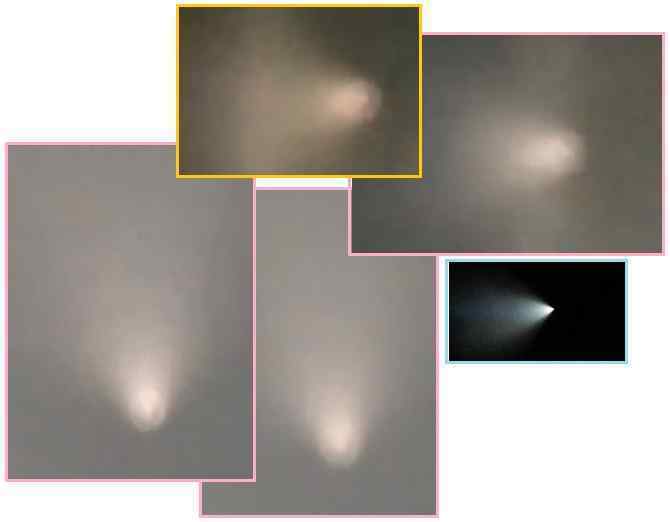 The lights, caught on video, show a swirl, with the tail of the swirl first in one direction, then another. Do rockets make 90 degree turns in the air, within a minute? Whether viewed from the front or the back or the side, a rocket forms a straight line. The dramatic Norway swirls in 2009 looked like a light from a distance too, and this California coast swirl was at a distance, thus seen from Arizona and southern New Mexico. Why the closure of flights coming into LAX from the Pacific? There is notable caution in Russia and Britain and other countries who are limiting or stopping flights near Sinai after the Russian A321 explosion, and notable caution in Sweden in closing their air space when their radar was affected. LAX has been affected by EMP before, on April 30, 2014 when their flight control system was flooded by a thrashing radar system flooding the system with error messages. In all cases, prior as well as present, the establishment is extending false excuses, false explanations for what is seen and the steps they are taking. We, in ZetaTalk, have warned repeatedly that airplanes flying over water where the rock is under stress are at risk of EMP due to arching from the electronic screech in the rock to the charged tail of Nibiru. We have detailed how the N American continent is being pulled into a bow, with the center of that bow near San Diego. Where ZetaTalk is not listed as an official consultant to Heads of State around the world, to Obama and Putin and others, they place great weight on our analysis and warnings. Thus the caution in moving flights from over the Pacific off-coast from LA to being inland. Compare these magnetic swirls to the Norway swirl in 2009. The similarities are exquisite. 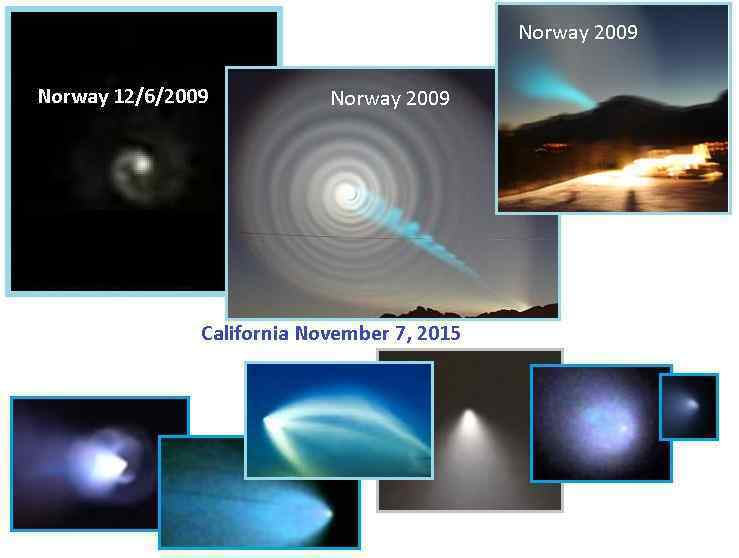 The Norway swirl involved a blue neon cloud, and a swirl – a complex display. ZetaTalk Comment 12/8/2009: Why the great swirl in the clouds around the swirling neon display? An electrical charge in the sky is not a static matter, as the path of lightning shows. Lightning is an accumulation between moving air masses that suddenly builds to the point where a torrent of electrons is on the move. But what if the charge does not accumulate in one place, but is constantly present over a broad area? As with all swirls that develop in nature, they start with a small movement in one place that creates a vacuum pulling matter behind it, and thus builds. Galaxies swirl. Water going down a drain swirls. And these large charged atmospheric swirls are chasing after some part of the tail waft that is more or less charged than the surrounding atmosphere. What occurs at the center of such a charged swirl is more electrical charge than the surrounding swirl, thus the center becomes a neon cloud that can be seen even at night, and wants to discharge, ground, in the Earth. And indeed, LAX has had radar problems in the past, which temporarily closed down the airport until resolved. An LAX ground stop was forced on April 30, 2014 when the radar system was so discombobulated that the computer system choked with error messages. The official excuse was that a high flying airplane kept registering at different altitudes, forcing the program to recompute flight paths. This occurred during the afternoon on April 30, 2:00 pm to 3:30 pm. Per the Zetas, the radar malfunction was due to rock stress from the N American bow. This created arching from the ground to the charged tail of Planet X. But the 2015 effort to force planes out over land, rather than taking the water route, is clearly an effort to prevent death by airplane when magnetic interference by the charged tail of Nibiru is apparent. A step in the right direction. There is a ground stop for that region. This affects the bottom third of California, the southeast corner of Nevada and the northwest corner of Arizona. And also southwestern Utah. Flights bound for LAX are being held on the ground. The outage began with news that planes are not being allowed to take off at Los Angeles International Airport. LAX airport spokeswoman said that the Federal Aviation Administration had put a "ground stop" on departures. Arrivals were still being accepted. Castles wasn't sure what caused the problem. An FAA spokesman did not immediately respond to a request for comment. The system was rebooted and fixed. The Federal Aviation Administration said the computer perceived the plane as a low-altitude operation and began frantically trying to reroute it down to 10,000 feet while keeping other planes out of its way. It used a large amount of available memory and interrupted the computer's other flight-processing functions. ZetaTalk Comment 5/10/2014: As predicted, the FAA has proffered computer program gibberish as its excuse for the LA ground-stop on April 30. The common man may believe that a computer system that had been in operation literally for decades would be befuddled by a high altitude plane but anyone familiar with how such systems are designed knows better. Every possible branch of logic is taken into consideration, and provided well-tested program code. Computer systems are given simulated input during system testing, so bizarre situations are tested, as well as routine situations. Thus this excuse, where the system seemed dumbfounded by a high altitude plane, fails on many fronts. What their excuse is implying is that the program was playing guessing games, endlessly and repeatedly. Who would program a system like that? Why is the LA area getting hit with EMP? The bow in the N American continent centers near San Diego, and thus the compression tension in the rock is most intense there. The stretch, where the outside of the bow along the East Coast is pulled taut, is likewise intense and thus the many sinkholes along the East Coast. The San Diego bow center can be traced through the continental US, shown by the number of earthquakes, for instance, in Oklahoma, as this Pole Shift ning blog attests. Draw a line from San Diego to the east, and where do you go? The total number of 3.0 quakes for 2015 has already surpassed 2014 with 10 weeks left in the year. There have been a total of 2333 quakes this year but most of these are less than a magnitude 3.0. Quakes with a magnitude of 4.0 or greater have also increased this year. There have been 22 4.0 or greater earthquakes so far in 2015. There were 15 in all of 2014. 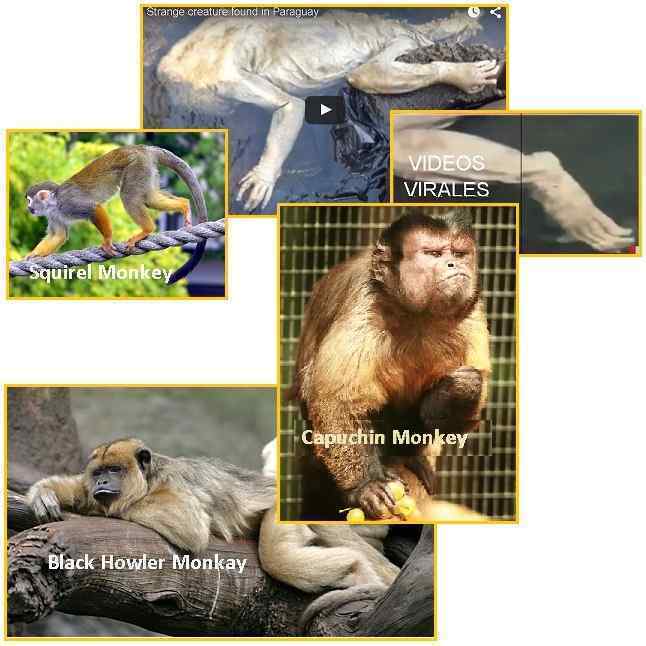 The mystery is not why the body of a monkey, washed up on a Paraguay beach, would be mistaken for a Chupacabra, but why so many in the mass media covered the story! It was clearly a monkey. But the Huffington Post, the UK’s Mirror and Daily Mail, and even Russia’s RT network covered the story. The Zetas explain. A bloated corpse that washed up in Paraguay last week is causing a sensation in the local media, with some speculating that the body is that of the legendary chupacabra. Ron Pine, former curator of small mammals at the Smithsonian, told Doubtful News that it's likely either a type commonly called the black howler monkey or a type of capuchin monkey. Scientists believe the origin of the chupacabra legend may be coyotes suffering from severe mange, according to National Geographic. However, other animals such as raccoons and monkeys have occasionally been mistaken for the chupacabra. In other instances, animal deaths likely caused by illness are blamed on the chupacabra. ZetaTalk Insight 10/31/2015: This is clearly a monkey carcass, but the real issue is why this has been presented in the media – the UK Daily Mail, Mirror, the US Huffington Post, and the Russian RT sites - raising the issue of the Chupacabra once again. In these cases, a DNA check would put the matter to rest. Why is this not even mentioned for the Paraguay corpse? Chupacabra is back in the news because it relates to the alien presence. It is an alien threat, and would allow former members of MJ12 cover for why they kept the truth from the public for so long. The matter is also presented as debatable. Yes there are real dead Chupacabra young found, starving and hairless. But there are also frauds and panic over dead monkey carcasses.